Chris Durant has a summary in the Times Standard. There is of course the one banning the use of cell phones while holding it in your hand. And as Durant puts it, minors will be prohibited from using any electronic devices while driving. Does this include the radio? GPS? Turning signal? Headlights? Bicyclists will be required to wear illumination while driving on a highway. Actually, that one makes perfect sense and I’m surprised it’s taken this long. But then there’s a rather idiotic if harmless law that requires us to acknowledge by signature that alcohol can impair our driving when we renew our license. Maybe they should require that we write it out a hundred times on a chalkboard. You can’t spraycoat your license plate lest Big Brother can’t keep a bead on you. There are a few others of note in the article. One item which probably won’t become law at the federal level is the Open Government Act (being pushed by Senator Patrick Leahy among others) if the President has anything to say about it. However, it may be veto proof. Among other things, the law would restore the standard in which no information can be denied the applicant without a showing of harm should the information be released (directly responding to Ashcroft’s order to deny any requests when harm is uncertain). It mandates that attorney fees to be paid to a prevailing Freedom of Information Act litigant must come from from the funding of the particular agency resisting the disclosure. It sets up a tracking system for requests. And best of all, if the request is not honored within 20 days, the agency is required to refund any fees for search or copying. If signed or the veto overridden, it will be the first shoring up of the FOIA in over a decade. This administration is perhaps the most secretive in history – to the point of obsessiveness. Now I’d like a stronger bill, such as suspension or dismissal for any federal employee who acts to frustrate an FOIA request without due cause. I’d also like to see the elimination of redactions with the explanation “not within the scope of the request.” If the document contains any pertinent information then it should be disclosed in its entirety absent a demonstration of harm. And I’d like to see a bill which enables you to make one request where you can list all the agencies you want searched, with perhaps a special agency to conduct the searches. My wife and I have been on maybe 3 or 4 “dates” over the past year, between the ages of our kids and our somewhat rigorous schedules. Mostly we content ourselves with our in-house down time once we get the kids to sleep – assuming they stay asleep. When we visit the Bay Area we have the grandparent option which we took advantage of last night. After an afternoon at the Exploratorium (the most crowded I’ve ever seen it in my lifetime) we dropped the kids off at my mother’s and went out for dinner and the second movie I’ve been to all year, simple pleasures often denied by the needs of parenting in a community where available babysitters are far and few. Some years ago I had a terrific dinner at an old restaurant in the Marina District of San Francisco called Izzy’s. Recently I’d noticed an establishment of the same name as I drove by Corte Madera on 101. Yesterday a quick Internet study revealed that it was the same business, or at least the same menu, and so we made reservations (wasn’t necessary). Their specialty is steaks cooked to perfection, but they’re also famous for their patented sides such as scalloped potatoes and surprisingly flavorful creamed spinach. I missed the old city feel of the SF restaurant, but the food was as I’d remembered it. It’s not cheap, but not off the wall either (though I’d be just as happy with a good steak at House of B or OH’s for a few bucks less and in doggy-bag proportions). Afterwards we headed up the road to the Northgate mall for a movie at a shocking $10.25 per ticket. I let my wife choose the movie and she was gracious enough to let me choose between The Great Debaters and P.S. I Love You (I think she offered the latter as a joke). I don’t have time for a complete review right now. It’s not a Dreamworks movie, but it’s pretty much a clone along those lines – complete with an uninspiring inspirational score, gorgeous if cookie-cutter cinematography, and big name cast no doubt “honored” to have been paid big bucks for such a worthwhile endeavor. 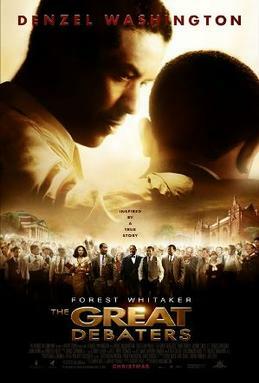 Denzel Washington (they don’t make movies without Denzel Washington anymore) played the part of a union organizing professor at Texas’ Whitfield College in this “inspired by a real story” account of the first black debate team allowed to compete with white colleges including ultimately Harvard. It takes place at the height of the Depression (there are a few Hoovervilles along the rail lines to remind you every once in a while) and is complete with obligatory references to Langston Hughes and W.E.B. Dubois (who sounds more like Booker T. Washington as quoted in the film, a rich piece of irony that would be greatly appreciated by the poet Dudley Randall), figuring that maybe an eighth of the education system victims watching might recognize at least one of those names. Okay, it was well done and all that, avoiding some of the Goodwill Hunting/Finding Forrester cliches. The young James Farmer (founder of the Congress of Racial Equality which decades later would fall victim to the hands of right wing hacks like Roy Innis) clinches his team’s debate victory over Harvard the “resolved” topic being civil disobedience. Having exhausted Gandhi and Thoreau, he finishes with a poetic license “inspired by a true story” account of his team’s witnessing of a lynching with “I have a right and even a duty to resist the law with violence or civil disobedience. Pray that I choose the latter.” He brings to their feet all the enlightened white Bostonians so different from the southerners, because we know Boston’s never had racial problems, right? It’s also noteworthy that in real history they never debated Harvard, probably because Harvard was not the national champion that year. They debated the USC team, which was. They did win the debate however. There are other historical liberties taken (I don’t think Farmer was actually on that team), but actually who cares? The movie unfortunately ignores the actual basis on which debate competition is won. For some reason the Whitfield College team always got to argue positions which they felt deeply about (it would have been much more interesting to see the arguments about integration reversed when they debated white teams), which seems like an unfair advantage to me. But it’s well produced, well acted, and guaranteed to make white people feel good about how much progress they’ve made over the decades. What else can an almost-all white liberal Marin audience ask for? And it wasn’t P.S. I Love You. I should note that my wife is rolling her eyes at my “review.” She likes the film, and I’m probably being a little too cynical for a gorgeous Sunday morning. Addendum: Here’s the Wikipedia excerpt on historical incongruence. The film is shot through with the horrors and humiliations of the Jim Crow era, the depiction of which is genuinely moving despite the undermining influence of the stagy and often heavy-handed direction. Debate seems like a singularly ridiculous subject for melodrama, since it’s bound by certain rules of logic that are designed to ward against the kind of emotional appeals that The Great Debaters is all about. In fact, Tolson spells out many of these rules in the beginning of the film, only to sit approvingly by while his team perpetrates so many logical fallacies that they’d make a great drinking game. This movie should make Washington and producer Oprah Winfrey a lot of money. I was just perusing the Media Matters site when I came across this gem. It’s a couple of months old, but it deserves all the attention it can get because I really think this is how many Iraq war supporters think. So basically, Obama’s weak on security because he was one of the few national political figures who didn’t buy the administration’s WMD claims hook, line, and sinker. Basically, those of us who knew it was being hyped because we’d seen it all before and bothered to remember really didn’t know the claims were being hyped and we were just lucky that our assumptions just happened to turn out to be correct. It certainly wasn’t that we were reading international and even some domestic intelligence reports which told us that Hussein was not a threat. Actually, what amazed me is how correct we turned out to be. I really expected them to turn up something. Way back when I interviewed David McReynolds (Socialist Party presidential candidate in 1980 and 2000) on KMUD a couple of months after the war broke out I asked him whether he expected us to find WMDs. His response: “Certainly. Just as I expect cops who shoot a suspect to death to find a gun on his person.” Point is, we never even found something solid enough for the administration to hype. Yet some pro-war folk chastise those of us who were right from the beginning, I suspect to preempt an “I-told-you-so.” Bottom line: we should have believed out government, and it was a lack of virtue on our part that ultimately made us right. That’s what I’m opposed to. A dumb war. A rash war. A war based not on reason but on passion, not on principle but on politics. Now let me be clear — I suffer no illusions about Saddam Hussein. He is a brutal man. A ruthless man. A man who butchers his own people to secure his own power. He has repeatedly defied UN resolutions, thwarted UN inspection teams, developed chemical and biological weapons, and coveted nuclear capacity. He’s a bad guy. The world, and the Iraqi people, would be better off without him.But I also know that Saddam poses no imminent and direct threat to the United States, or to his neighbors, that the Iraqi economy is in shambles, that the Iraqi military a fraction of its former strength, and that in concert with the international community he can be contained until, in the way of all petty dictators, he falls away into the dustbin of history. I know that even a successful war against Iraq will require a US occupation of undetermined length, at undetermined cost, with undetermined consequences. I know that an invasion of Iraq without a clear rationale and without strong international support will only fan the flames of the Middle East, and encourage the worst, rather than best, impulses of the Arab world, and strengthen the recruitment arm of Al Qaeda. I am not opposed to all wars. I’m opposed to dumb wars. But what difference does it make now, right? The “surge” has won the war. I know it’s true because I saw it on television. Photo of Barnes comes from his Fox News page. It’s been a long day and I can’t find anything inspiring in any of my news sources. I’m getting ready for bed, and I just have a few questions. 1. Is there a good poultry butcher in Humboldt? I need chicken feet. A big bag of them. I want to try to make my own dim sum meal. 2. Why did Santa promise to give the greedy magician something in his stocking? He’d just tried to kill Frosty. Would Santa have given him a gift if he’d tried to kill the girl? 3. Does it really make any noticeable difference if you don’t sift the flour in your pancakes? 4. Exactly how many seas did the white dove sail before she slept in the sand? Do doves actually sleep in the sand? 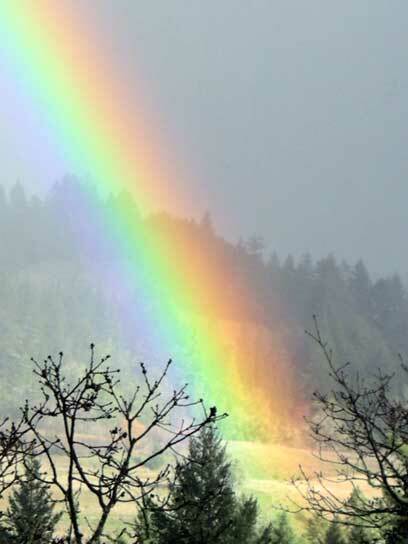 The photo is one of several of a “rainbow show” over at Humboldt Homestead. Some other striking local winter photos as well. Benazir Bhutto killed at 54. Bhutto’s death marked yet another grim chapter in Pakistan’s bloodstained history, 28 years after her father, Zulfiqar Ali Bhutto, another ex-prime minister, was hanged by a military dictatorship in the same northern city where she was killed. Second addendum: Here’s some history and analysis from Aziz Huq at the Nation. I’m preparing a post on the history of the Israeli peace movement, which should be ready in the next week or so. In the meantime, I thought some of you might be interested in perusing some of the links which I found, mostly at the Peace Now site. The photo is of a peace demonstration in Tel Aviv during the 2006 war to which I previously linked. There are more at the Gush Shalom site. You can click on the photo to enlarge. Addendum: Not an Israeli peace group, but an American Jewish group with a very thoughtful summary of the conflict and its associated issues. And it contains a list of Palestinian peace organizations per the backhanded request in the thread. I’d heard something about it, and now I’ve read Cristina Bauss’ article in this week’s Independent. They were of course protesting the lack of access to the post office boxes after 6:00 p.m. (5 on Mondays) and on Sundays and holidays. Redway has no home delivery, so they are forced to have boxes. For those who can’t get off work right at 5:00 these hours are a problem. Apparently the postmaster, who had previously said he would consider timed locks, has ascertained that such a solution violates postal regulations. I’m not sure why the Inverness solution is out of the question (door locks opened by post office keys). And apparently hiring somebody just to open and close violates the Homeland Security Act or something. If the limited hours are necessary, why does Garberville’s office remain open 24/7? In fact, according to the article none of the other local post offices closes for any significant period of time, except for Alderpoint which closes on Halloween because of “particular problems.” (Ghosts?). Roger Rodoni showed up. He blamed the problem on residents who put up with urination, defecation, and “other behaviors.” The protesters presented a petition requesting Sheriff nighttime surveillance. But there you have it. Rodoni is now firmly anti-defecation. Give him credit for being there, but don’t let him distract from the issue, which is access to mail – not crime or homelessness. They seem like good choices. Last year several runner-ups came to mind, but this year the list seems complete at first glance. Some of the choices are obvious – the PALCO Bankruptcy, the TPZ controversy, the trail/rail debate and its impact on local politics, the Shove, deaths of two local celebrities, etc. Only one Sohum story made it to the list this year, and it’s you-know-what. The story was obviously a little dated with the sentence, “People Productions and “Reggae Rising” won all the key skirmishes.” Obviously that string came to an end earlier this month, and as a consequence the parties are back at the negotiating table. The other story which may be of significant Sohum significance is the Arcata grow controversy and the city’s response to it. There are reports of similar grow houses in Garberville and Redway, and with the housing crunch and the limitations of fire department resources the controversy is bound to be raised here as well. We have no incorporated townships down here, which means we have to go to the county and it may play into the Second District race politics at some point. Hank also summarizes the Klamath River settlement, an issue on which I’ve only made a few posts and have followed closely. Lastly, the story on the housing price collapse is of significance countywide (and statewide), and I would debate whether it’s economic impact is more negative than positive. Secondly, one aspect of the story that probably should be investigated is the degree to which it has impacted Sohum. We have a unique situation here where back-to-the-landers are aging and looking for comforts they’d sacrificed earlier for their lifestyle. That and the grow-house phenomenon have kept rents up. Housing prices have probably dropped, but from what realtors have told me the impact isn’t quite what it’s been elsewhere. Rents remain ridiculously high. Addendum: Here is the SF Chronicle’s top 20 stories for the Bay Area, the first being Gavin Newsom’s affair. The oil spill comes after that. Second addendum: David Cobb provides his own list of 2007 stories of importance to progressives. 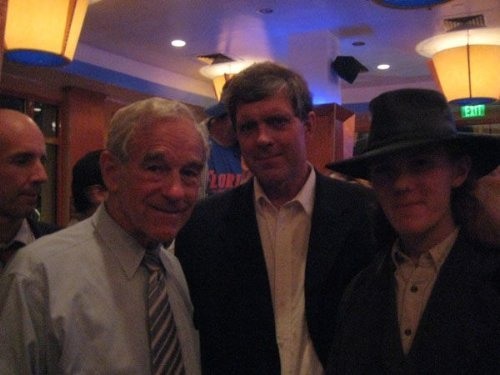 "Don’t vote for Ron Paul"
I don’t have much against Ron Paul per se. That he’s keeping the Iraq debate going in the Republican primaries is laudable. But he really ought to keep better company. Yeah, it’s LGF, but that doesn’t look like a photo-shop job. During the Quilez campaign I made telephone calls to get the vote out and often found myself being prosylatized in return from die-hard Paul voters. And there are more than a few signs up around Eureka. I’ve recently determined that rush hour travel from 101 south of Eureka to the Courthouse is faster if you take the Herrick exit to Harris, then take I the rest of the way. You get blitzed with Paul signs along that route. Anyway, more power to him in the Republican primaries. If by some miracle he wins (let’s say all the other candidates die in a meteor fall), I won’t be voting for him, unless I’m converted to the virtues of privatizing the sidewalks before next November. Addendum: Mitt Romney’s campaign is obviously less than grateful for Paul’s presence in the race. Romney’s Illinois campaign chair was stupid enough to be caught on camera acting like a dickhead.